← Why BUSYNESS Should NOT Be an Excuse to Care for Your Elderly Parent? When you think about the dangers you might face in the local neighborhood, you don’t always think of the indoors, do you? After all, what’s there to harm you when you’re in the safety of your home? Well, to be honest, there are a lot of things. Take fall hazards, for example. As the name implies, these hazards will put you at risk for suffering a fall. But is a fall really dangerous? Yes, it can be. 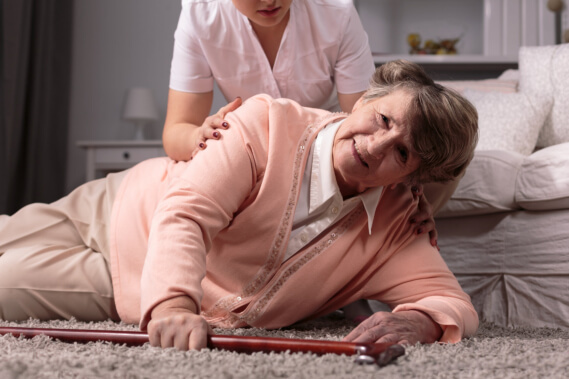 Especially for seniors who have lower bone mass because this leaves them with a higher chance of suffering a fracture from sudden impacts (caused by slipping and falling). While these are all fine home decors, they can, however, decrease the friction and grip of your foot, which eventually, can lead you to suffer from a fall. The solution: Secure them in place with an adhesive such as tape-on velcro. Do you have lines of electricity running freely along your floor? Your feet can get caught in them and cause you to slip. The solution: Round them up with a bunch of elastics to keep them tidy and neat. If you’re on a budget, you can even make use of empty toilet paper rolls to keep the wires together. Is one of the floorboards a bit wonky? Do your tiles have chips in them? These rough edges could get caught against your pant leg or skin and cause an injury. The solution: Have them replaced or repaired. Not only will your floors look better, but it will smooth out any of the unsightly protrusions and give you a better environment for walking. After tending to these potential fall hazards, your home should be a lot safer than it was before. In fact, you might even notice that there’s a lot more free space in your rooms now. Isn’t that great? In case you need a bit of help with tidying up the area and completing daily errands, you can always count on Abundant Life Assisted Services to bring you quality In Home Elderly Care in Georgia. We have highly trained care personnel that will reliably bring you the Senior Care Services you need and more. Let us know what you need assistance with and when you’d like us to come over. We’re constantly on standby seven days a week to heed your call. Don’t hesitate to connect with us today! Did you find this blog post helpful? If you did, be sure to share it with your friends and family members so they can keep their homes free from safety hazards too! This entry was posted in safety hazards and tagged care personnel, Elder Care, Fall Hazards, fracture. Bookmark the permalink.